Ford knows something you may not – that the US is a CNG exporter and those in the industries using powerful Ford F-450 and F-550 trucks would love a CNG bi-fuel option. Working with a third party firm, Westport Industries, Ford can now offer these modified trucks, capable of using CNG until it runs out, and then switching to a second onboard tank of gasoline. The trucks will be shipped through the brand’s normal distribution process. Westport is also responsible for creating CNG-powered Ford F-250 and F-350 trucks at the Westport Kentucky Integration Center (WKIC), a Ford Qualified Vehicle Modifier audited facility, right next to the Ford Kentucky Truck Plant. 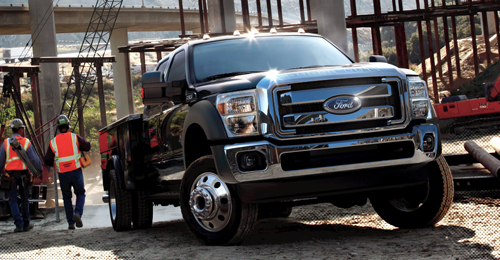 The new F-450 and F-550 trucks have passed the same rigorous testing for safety and durability Ford uses for all its OEM products. Using the same integrated transportation system as the other Westport modified Ford products reduces the end costs to the consumer. The bi-fuel trucks can only be ordered at designated Westport affiliated Ford dealerships, and the Ford F-450 and F-550 Super Duty Chassis Cab pickups come ready to go with Westport WiNG Power Systems and feature an equivalent warranty for all similar powertrain and emissions components. "The expansion of our product line builds upon our proven technology of the Westport WiNG Power System and extends our product availability to a different end user," said John Lapetz, Vice President Westport LD and Managing Director, North American Vehicle Programs. "With a higher degree of application flexibility and increased gross vehicle weight, the Ford F-450 and F-550 Super Duty trucks allow us to grow a solid footprint with customers who were not serviced with the Ford F-250 and F-350 CNG bi-fuel trucks." At an added price of $9,500, the Westport WiNG Power System is added to the 6.8-liter V10 engine in the Ford F-450 and F-550 trucks, offering a combined fuel range of roughly 650 miles (at nine mpg) from a CNG capacity equal to 42 gallons of gasoline plus a standard 40-gallon gasoline tank. That would mean 290 miles on CNG alone. The new bi-fuel trucks are intended for industry fleets concerned with natural resources, construction, delivery and public utilities, in addition to government and transit operators. Theses trucks provide the opportunity to burn cleaner, domestic fuel wit savings from 30 to 60 percent realizable in as little as two years. Commercial vehicle bodies can be used with the Westport WiNG bi-fuel system in support of commercial fleet customers that need trucks equipped to handle various jobsite environments. "In partnership with service body companies based in Louisville, Kentucky, Westport will integrate the Westport WiNG Power System on the Ford F-450 and F-550 trucks with second unit bodies," said John Howell, Senior Director, Marketing, Westport. "Many standard configurations exist for bodies with a minimum of 84CA used in combination with a tank pack and custom bi-fuel configurations can be engineered for virtually any second-unit body with a minimum order of 10 units." Makes sense to me. Trucks are perfect because they have the under body space for the cylinders. Lower CO2, domoestic reserves growing, not shrinking, no sacrafice in performance. Slam dunk for every worker in the gas industry. That alone would run up some god numbers for Ford.